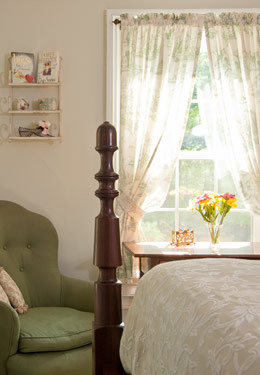 Lily of the Valley is cozy and accented in light green and floral motif. 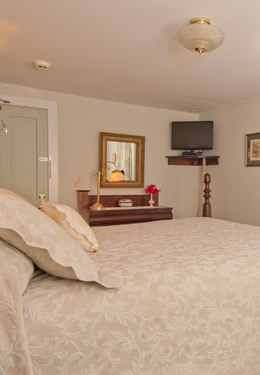 Located on the second floor at the rear of the inn it is just off the spacious porch which you can see from the rear window in this room. This comfortable and cozy room equipped with a small desk is a favorite among our business and vacationing guests. Being at the rear of the building also insures it is one of our more quiet rooms. A comfortable chair by the window provides one with that nice quiet place to just relax or delve into that special novel you always wanted to read.